Incredibly, it’s been almost six months since Dark Webb was published. Time flies, and now book two in the series is here. Thaddeus Webb is back in Tangled Webb, and unfortunately for him, life isn’t about to get any easier. Thad thinks he’s escaped from the world, but the world has other ideas and is intruding on his peaceful retreat. A seemingly minor incident kicks off a series of events which lead our hero into all sorts of trouble. I don’t want to give too much away, so let’s just say that nothing is as it seems, and before he knows it, Thad’s caught up in a race to avert an atrocity. 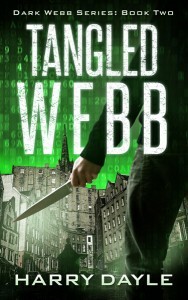 Tangled Webb is out now in ebook edition, and the paperback will follow. It’s available from Amazon and Amazon UK, as well as all the other major retailers. Aside from working hard on the Dark Webb series, I’ve been very busy getting another project off the ground. I’m sworn to secrecy for the time being, but I can’t wait to tell you more in due course — stay tuned! In the meantime, I really hope you enjoy Tangled Webb.